Modern humans are characterized by specialized hand morphology that is associated with advanced manipulative skills. Thus, there is important debate in paleoanthropology about the possible cause–effect relationship of this modern human-like (MHL) hand anatomy, its associated grips and the invention and use of stone tools by early hominins. Here we describe and analyse Olduvai Hominin (OH) 86, a manual proximal phalanx from the recently discovered >1.84-million-year-old (Ma) Philip Tobias Korongo (PTK) site at Olduvai Gorge (Tanzania). 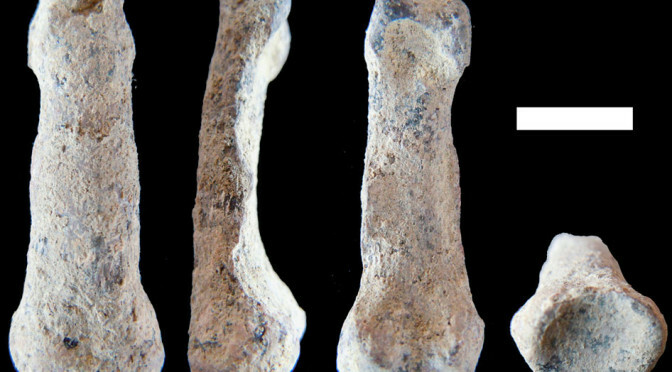 OH 86 represents the earliest MHL hand bone in the fossil record, of a size and shape that differs not only from all australopiths, but also from the phalangeal bones of the penecontemporaneous and geographically proximate OH 7 partial hand skeleton (part of the Homo habilis holotype). The discovery of OH 86 suggests that a hominin with a more MHL postcranium co-existed with Paranthropus boisei and Homo habilis at Olduvai during Bed I times.